Should Beginner Guitar Players Go Acoustic Or Electric? When you first decide that you want to learn the guitar, you’ll be faced with plenty of questions. But you’ll ask yourself one before any other. You’ll have to decide whether you’ll start to learn the instrument on the acoustic or electric guitar. Though you may have a very straightforward answer, to some this isn’t an easy decision to make. There are advantages and drawbacks to both kinds, making it difficult to choose just one. For those of you who count Mumford and Sons, Bob Dylan, and other folk roots artists as your favourite musicians, acoustic might be the route you want to take. It’s the perfect guitar for bedroom sessions and singalongs around the campfire. Its portability makes it the cheaper options, as you won’t need an amp or any wires to make a sound. An acoustic guitar relies on the strings’ reverberation within its wooden body. As a result, the tone of your notes will be lush and rounded by a richer sound that can be at times grungy and dirty or simple and pure. If you prefer more head-banging than banjo-plucking in your music, you’re probably already leading towards the electric guitar. Brash, loud, and tinny, the electric guitar has the ‘oomph’ you need to get through more aggressive songs and solos. While it’s useless without an amp, once plugged in you can change the sound of its voice with a variety of cool peddles and distortions. Though this will ultimately end up costing your more (and make your outdoor kumbaya near impossible), it means you have the versatility to transform the tone, timbre, and dynamic of your guitar with the press of a button. Even armed with this knowledge, it can be difficult to make the ultimate choice. As a full time metal head who likes to listen to bluegrass on the weekends, you might want to get both. If that’s in your budget, then that’s great. You should buy all of the guitars that you can. But if your finances make buying more than one guitar an impossibility, you’ve got quite the decision ahead of you. 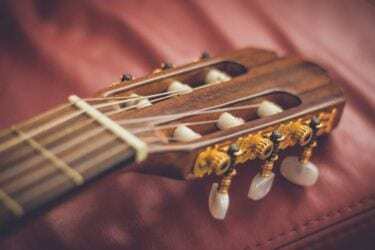 To make it easier on yourself, you should explore the range of sounds you can make on both the acoustic and electric guitars. Spend some time at your local guitar store to try out those makes and models you wouldn’t otherwise get to try at your friends’ houses. Usually a local store that’s been around for decades is one of the best sources for guitars in Canada. Not only will they have the selection of acoustic and electric guitars that you want, they’ll have the professional expertise to guide you through their collections. Eventually, you’ll have to come to a decision. Whichever side you ultimately commit to, once you have your guitar you should make your practice a part of your daily routine. Add to that instruction from a professional guitar teacher (perhaps from the same store you purchased your guitar), and you’ll be the master of your instrument – whether that’s acoustic or electric! I’m afraid I’m not at all musical so have absolutely no opinion on this. I do wish I was able to play the piano and violin like my cousins though.